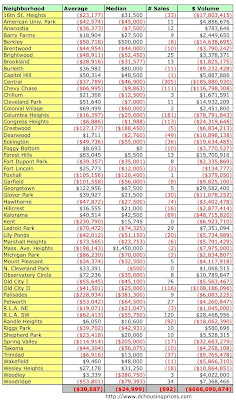 The WaPo issued its annual DC area housing report Saturday and, once again, they continue to under report District sales. The WaPo says it uses the District's data, but for the life of me I don't know what data they're analyzing and where the rest of it went. All I can figure is they ignored condo sales and threw away 1/3 of single family home sales. According to the WaPo, 2239 homes sold in 2008, ending the year with a median sales price of $520,000. 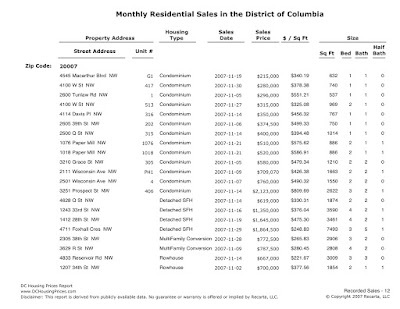 Moreover, the WaPo asserts that District median home prices rose when my data and MRIS' show it fell. The District fared the best out of all the jurisdictions in the region, according to The Post's analysis. While sales volume slid 30 percent, to 2,239 homes from 3,212 in 2007, the median home price rose 8 percent, to $520,000, from $480,000. 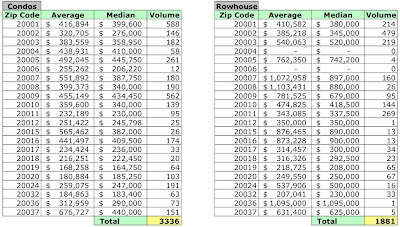 The biggest price increase occurred in Georgetown's 20007 Zip code, one of the District's most expensive neighborhoods. There, the median home price shot up 18 percent, to $1,075,000 from $909,150, even as the number of sales decreased to 199 from 237. "The people buying there are going to be more economically insulated, just by the mere fact that you have to be wealthy in order to buy there," said Joseph Himali, owner of Best Address Real Estate in Georgetown. Actually, District unit sales for homes and condos fell 11.75% to 6697 in 2008 while the median price fell 6.25% to $375,000. In the WaPo's highlighted zip code 20007, 403 units were sold, a 7.99% decrease, and the median price was $746,440, a 3.46% increase. In regards to what Himali said, blah, blah, blah. So why am I all fired up about the WaPo's poor, inaccurate reporting? Because people depend upon it and treat it as truth. For example, the realtor selling one house I looked at Sunday had the WaPo report laying on the dining room table, as if to say "relax, things are OK here." Well, in that zip code, 20015, my data shows that average prices fell 7.72%, median prices fell 1.85%, the number of units sold fell 38.27%, and the dollar volume fell 43.03% in 2008. The neighborhood's data? Unit sales were lower by 111, the average price fell $67K, the median price fell $9800, and dollar volume dropped $116.8MM. WaPo? Median prices rose $30,000 (+3.6%) although the number of homes sold fell 25%. Don't worry, be happy? I've exchanged emails with the WaPo about this in the past and they acknowledged that their data for condo sales was off - they knew it, but since the data was sourced from thr District, they couldn't explain it. OK, fine. But to under report 2008 sales by two thirds should give the WaPo and its readers pause. Did they even fact check against MRIS' data? 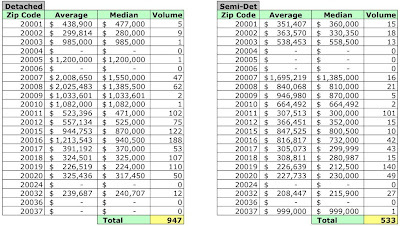 The table below shows 2008 average and median sales prices and unit volume by zip code and the percentage change from 2007. 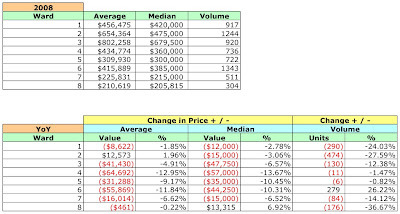 The following table shows the change in prices and sales volume for each District neighborhood. Dollar volume fell by $666MM and 892 fewer units sold. Few District neighborhoods escaped the year unscathed. In 2008 the District recorded 6697 residential sales. The average sales price fell 5.94% and the median sales price fell 6.25%. The condo market took it on the chin: unit sales were down 21.17% YoY and dollar volume tumbled 26.78%. The number of homes sold was esentially flat and dollar volume was negative, down 8.34%. All Wards suffered. 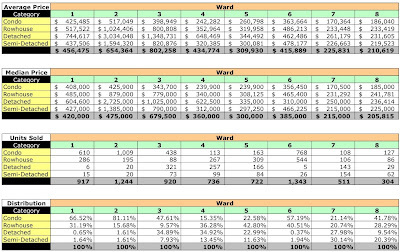 Only Ward 8 showed positive growth in pricing, with the median value there increasing 6.92%. 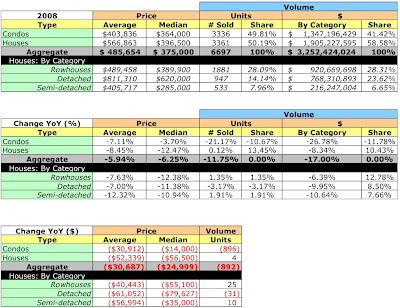 Condo sales ruled Wards 1, 2, and 6, constituting 66.52%, 81.11%, and 57.19% of units sold, respectively. 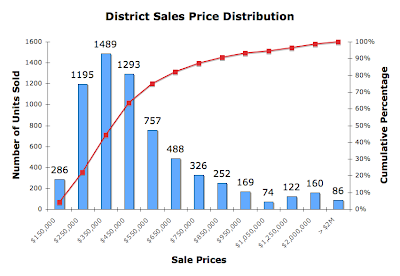 The chart below shows the distribution of 2008's recorded sales by sales price. I agree with Anon 8:07. For the life of me I can't understand how someone who has spent as much time as he has studying the market would think now was a good time to buy a house in DC. Keith - you may not know this, but their report is for homes only. They do a separate report for condos as well. Adding the condos back in doesnt square the numbers, but at least it makes them closer. I'd sent the reporter an email asking for clarity on the data and received no reply. Even if their data is limited to homes [detached / semi-detached / rowhouses], it is still way off. Look at my data and MRIS'. Assuming condos are excluded, they're still under reporting by about 33%. Missed the condo report - there was nothing in the printed newspaper about condos so I didn't bother looking for it too hard on their site. I will look at the link later. Historically, their condo data has been even worse and they've admitted it. * Interest rates are at historic lows. * Conforming loan limits have been raised to > $700K in 2009 so you can get the 4.6-5% interest rates. * The interest payment on the loan would equal my current rent, so the incremental cost is low [ignoring PMI, taxes, and insurance]. * I plan to stay in the place 15 years. * I have no expectation of paying full price. I plan to let the seller take the future loss in value through a lower price and/or seller credit. I've seen homes reduce prices by $50-75K at a pop and not sell even after $100K price reductions. I've seen new condos lower prices by $56K. * I don't have to buy. I can wait. So if I find the right place and can get it at the right price, deal. Otherwise, I wait. The WaPo's condo report is laughable. They under report 2008 home sales by about 1/3 and condo sales by 2/3. Good "in-depth analysis". It's unfortunate readers take it as truth. i've always thought the real estate section of the post was full of crap and written by real estate agents as essentially propaganda. the post is in big financial trouble. who do you think pays big advertising dollars in the real estate section....you do the math. Thanks so much for your myth busting! I love your site.